So, why is 'Mr Greedy' as hard to read as 'Of Mice and Men'? Home | Books & Quizzes | So… why is ‘Mr Greedy’ as hard to read as ‘Of Mice and Men’? You might have seen some coverage surrounding our recent ‘What Kids Are Reading’ report about Accelerated Reader book levels. Specifically, news articles with headlines like ‘Mr Greedy “almost as hard to read” as Steinbeck classics’ from BBC news. So, what’s going on? We’re here to explain. Teachers in schools that use AR regularly test students with our Star Reading assessment programme, which determines each student’s ‘Zone of Proximal Development’ (ZPD). The ZPD gives students a range, e.g. 4.5-5.4, which tells them the book levels they should look between when choosing their next book. The book level is a measure of the complexity of the text. Every book included in the AR programme (of which there are over 35,000) has been assigned a book level. The student picks a book with a book level that’s within their ZPD to read next. By choosing from their ZPD, they can be confident that the book isn’t too easy (which would mean their reading skills won’t progress), nor too hard (which would mean that it’s too frustrating). Every year, our ‘What Kids Are Reading’ report draws on Accelerated Reader data from over 5,000 schools, and over one million children, from across the UK and Ireland, and looks at their reading habits – including whether they’re reading books that are the right book level for them. You can download this year’s report here. But how do you know what level to give a book? Word difficulty levels have been determined for over 100,000 words. They’re based on data from the world’s largest database of words from actual books, which analyses more than 170,000 books and nearly 2.5 billion words. In fact, the ATOS level of any text can be calculated using a simple online tool, the ATOS Analyser. As well as the ATOS Analyser, the Accelerated Reader Bookfinder is publicly available too. So if you’re curious about how we’ve rated your favourite children’s/young adult books, take a look! This extract may be talking about a simple, lighthearted subject matter, but the ATOS formula doesn’t analyse that – remember, it analyses words and sentences alone. Of course, you wouldn’t expect a child to finish Mr Greedy and then select Of Mice and Men for their next read, and neither would you expect them be to understand it to the same degree. This one extreme example illustrates that book levels don’t paint the whole picture. ATOS book levels are consistent, reliable and objective measures of text complexity. Objectively, the formula considers the most important factors in determining the complexity of text and uses the largest data sample of its kind in the world to determine the results. ATOS is reliable in what it measures and is an extremely useful guide for students, librarians, parents and teachers. But – and it’s a big but – ATOS book levels are not the only way to determine how suitable a book is for a student: as the Mr Greedy / Of Mice and Men example demonstrates. There isn’t a scientific formula in the world that can read and analyse the plot of a book, the maturity of the themes addressed, or the sophistication of the literary devices that the author uses. You might be surprised to see us admit that book levels aren’t the be-all and end-all. But we’re not ashamed of it! Here’s the thing: Accelerated Reader was never intended to replace the role of the educator. It’s important for students to be able to independently find and choose their own books, of course, and this is a key skill that AR tries to foster and nurture. But the guidance of librarians, teachers and parents is essential to the successful implementation of the programme, and therefore essential to creating lifelong readers. Some themes explored in a book might be unsuitable for particular readers. Some literary devices used in a book will not be appreciated fully by students who can otherwise follow its plot. Some books will simply be too long for a particular child to read, even if they are able to read and enjoy shorter texts that are just as complex. 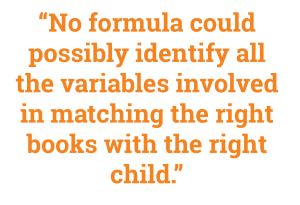 No formula could possibly identify all the variables involved in matching the right books with the right child. So, how can you choose the right book? We want to do our best to help educators, so as well as book levels, all books on Accelerated Reader are given an Interest Level – either Lower Years, Middle Years, Middle Years+ or Upper Years. This is a rough guide for teachers, librarians and parents to indicate how appropriate a book is for certain age groups, and it’s decided by the real-life member of our lovely content team who reads the book and writes the corresponding quiz(zes) on it. Mr Greedy has an interest level of Lower Years, while Of Mice and Men has an interest level of Upper Years. This tells you that the adult themes in Of Mice and Men would make it inappropriate for those who would normally be reading Mr Men books – of course. Another quick win in book selection is the length of a book. In Accelerated Reader, the number of ‘points’ awarded to a student for passing a quiz on a book is partly determined by the book’s length. Mr Greedy is worth 0.5 points, while Of Mice and Men is worth 4.0. But of course, you don’t need a points guide to figure out roughly how long a book is! If you know your children, and you know what they’ve been reading, it won’t be difficult to help them find a book that’s the right level, the right length, and the right subject matter for them. Accelerated Reader will always be about encouraging students to read better, read widely, and read for pleasure – and we need teachers, librarians and parents, not just scientific formulas, to achieve this. So, there you have it – an explanation of those crazy headlines you’ve been reading. Celebrate World Autism Awareness Week with a great book!